In fall 2006, approximately 140,000 American troops were deployed in Iraq, compared with about 20,000 in Afghanistan. By September 2009, there were 65,000 U.S. troops and nearly 40,000 NATO soldiers in Afghanistan, with 124,000 still in Iraq. During those same three years, reporters and the news organizations that they represent also have confronted enormous change. Print and broadcast news outlets are struggling both to adapt to and compete with online media. Although people are reading newspapers in record numbers, many are reading them online, a factor that has toppled the traditional advertising model. Plummeting ad revenues have led to layoffs, slashed budgets and closures. Meanwhile, broadcast news organizations seem to compete for audience by increasing the number of shouting matches rather than nuanced, unbiased coverage of important stories. "Main News Sources for Americans," page 7.) "Viewership of serious news programs in broadcast is turning down sharply, so broadcasters are turning even more toward less serious news," said conference moderator Ralph Begleiter, director of the Center for Political Communication at the University of Delaware. This strategy has had a major impact on coverage of Iraq and Afghanistan. "Let's face it, most Americans could care less whether the lights are on in Baghdad today or whether young women in Afghanistan are going to school," said Begleiter. "Most Americans just want to know when our boys are coming home." Against the background of these changes in the news business are two wars that are extremely complicated to cover, Afghanistan even more than Iraq. How does the military deal with reporters who are bloggers with strong points of view and no organizational affiliation? "You're dealing with irregular media as well as irregular warfare," said Begleiter. This puts an added strain on an adversarial relationship. Irreconcilable differences exist between the way the military and media carry out the same mission: to support the nation. "Many people inthe military believe that the way to be a team player is to support winning the war, which supports the nation. It's a logical conclusion." The media, on the other hand, play the role of devil's advocate in monitoring institutions like the military and the government. "Their purpose in life is to pick at the scab, to find out where the problem is. Of course, the ultimate goal is to help fix the problem," Begleiter said. 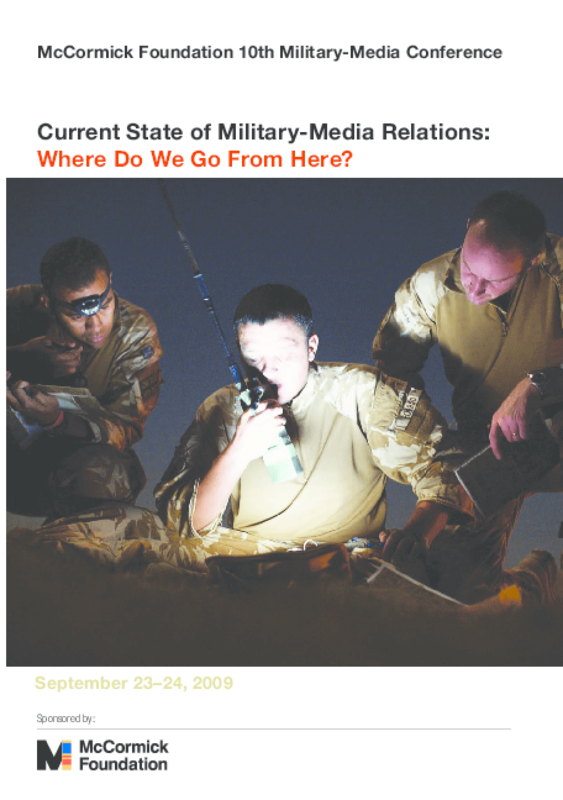 Title: Current State of Military-Media Relations: Where Do We Go From Here?